On the 18th January 1978, 15 police officers led by Chief Superintendent Jack Bowman walked out into the snow. They were searching the farmland to the north of my village on one of the UK's biggest murder hunts for 20 years - a spree of five murders across the UK. They were looking for the body of an elderly lady, who they believed had been killed a month earlier and over 400 miles away. But the oddest thing is this: almost every account of the story gets one detail completely wrong, and I only found out the truth by researching it myself. - read on to find out what it is. And why were they searching at my tiny village 400 miles from the murder scene ? Also why, even after the murderer confessed, was no-one ever convicted ? Read on to find the answers to all these questions ! 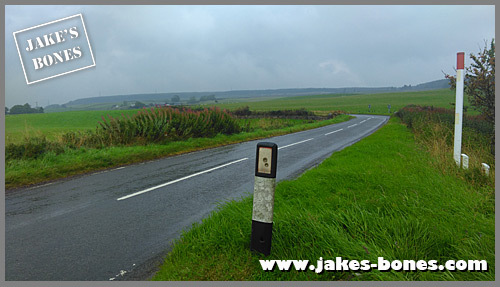 From my village, the main road turns north to Crieff, about 13 miles away and where my school is. But just a few miles out of the village, there is another road which heads west through some desolate countryside., and that valley includes some of the woods where I have done a lot of my best bone collecting, such as Suicides Graves and Titus Well. This is the road, looking north-west, with the woods on the far horizon. A short distance up that road is a farmhouse called Over Ardoch, which is now a cafe and soft-play area, but in 1978 it was a working potato farm owned by Thomas Rowe and Sons, and it was around there that the police were searching. But the snow was already hard on the ground, and while they were out another four inches fell, making finding a body almost impossible. The newspaper report at the time said they wore heavy sweaters and coats to keep out the bitter cold. At lunch time they went back to the Braco Hotel for a lunch of lentil soup, steak and kidney pie and apple sponge before going back to the fields and digging until dark. They were looking for what they believed was the second murder victim out of five. The body of the fifth murder victim had been found two days before, in North Berwick, east of Edinburgh, and two suspects had been arrested at the time. The body of the fourth murder victim had been found in Dumfries four weeks earlier, on Christmas Day. And the third victim's body had been found near Inverness. Normally murder is quite a secretive thing but this murderer told his story many times - and even wrote books from prison. He was called Archibald Hall, but at the time of the murders he had changed his name to Roy Fontaine. He was born in Glasgow, about 30 miles away, in 1924, and he was 54 when he was sentenced to life in prison in 1978. He stayed in prison until his death in 2002, and at the time he was the oldest prisoner in the UK. The story as he told it was that by the age of 18 he was already a criminal, having committed lots of scams and robberies, and after two "smash and grab" raids on two London jewellery stores he was sent to Wandsworth Prison aged 26. In the library there he read up on jewellery, porcelain and antiques, and then he started working as a butler. The problem with his story is that lots of the details were wrong and he exaggerated a lot of his crimes, and he left a lot else out. Early in his life hew as found to be insane by a court three times. In one robbery in Edinburgh he claimed he stole valuables worth £100,000, but during the court case it was said to be worth just £5,000. Other events that he claimed happened were highly unlikely to have happened. He was a robber and a thief, but he wasn't really that good at it. By 1st November 1977 he became the live-in butler (using forged references) to a wealthy former MP, Walter Scott-Elliot aged 82, and his wife who lived in London. It's most likely he knew about the Scott-Elliots through a friend called Mary Coggle, or "Belfast Mary" who was from Belfast but who worked in a pub in the Kings Cross area of London and who used to be the cook and housekeeper for the Scott-Elliots. 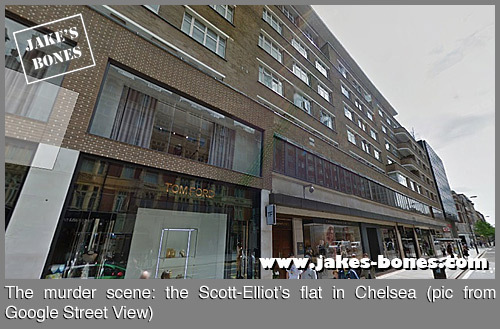 One evening in December 1977 there were four people in the Scott-Elliot's flat in Chelsea, London. Soon two would be dead, and two would be under arrest. Almost as soon after he moved in, Fontaine was thinking about robbery. He was already stealing from the flat, including 76 silver Edward 1 pennies saw that a nearby flat could be broken into via the Scott-Elliot's flat. He asked a barmaid he knew, Mary Coggle, who was from Belfast but who worked in a pub in the Kings Cross area of London, who recommended a housebreaker called Michael Kitto. (Wikipedia says Mary Coggle was the housekeeper for the Scott-Elliots, but she wasn't at the time). On the 8th December, after they had drunk quite a lot, Fontaine showed Kitto round the flat, thinking Mrs Scott-Elliot was either asleep or not there, when she suddenly appeared and demanded to know what Kitto was doing there. While the two men blamed each other later for the murder, Mrs Scott-Elliot was smothered with a pillow while her husband slept nearby. It then gets even weirder. The story varies depending on who you listen to, but this is the version given in "The Monster Butler" by A.M. Nicol, which is different to what Fontaine later said in his own autobiography. Instead of running away, Fontaine stayed at the flat, and the next morning told Mr Scott-Elliot, who was old and easily confused, that his wife had gone away for a few days, and that he should spend the day at his club. Then Mary Coggle dressed up in Mrs Scott-Elliot's clothes, wore a wig, and went round banks in London withdrawing lots of money from the Scott-Elliot's bank accounts. 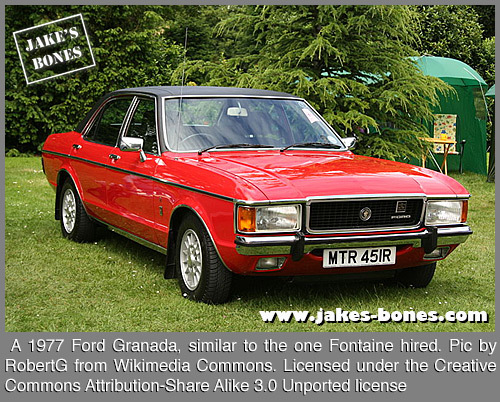 The next day Fontaine hired a Ford Granada car , registration VGE 999 R from a firm called Godfrey Davies in London SW1 at £150 a week. Fontaine pretended he was the godson of Mrs Scott-Elliot, Kitto pretending he was the chauffeur, and Mary Coggle still pretending she was Mrs Scott-Elliot herself. They first drove 250 miles north with Mrs Scott-Elliot's body from London to a house he was renting at Newton Ardosh, Cumbria under the false name of "Robin Thompson". The next day they drove about another 125 miles further north into the middle of Scotland, had lunch at a hotel in Crieff (where my school is), still with her body in the back of the car, then dumped Mrs Scott-Elliot's body. After that they drove to the Tilt Hotel in Blair Atholl where they stayed overnight. 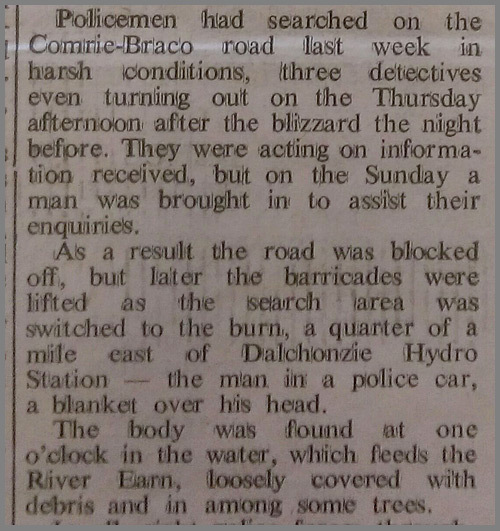 The next day, the 14th December 1977, after stopping off for a drink at the Struy Inn near Beauly, and probably other spubs as well, they killed Mr Scott-Elliot by hitting him with a spade, and left his body near to the Tomich to Cougie Road in Invernesshire. They didn't realise it at the time, but they were spotted walking back to the car by a local girl. After they murdered Mr Scott-Elliot, they drove to a hotel in Aviemore to stay overnight, then after that they drove back to the house in Newton Arlosh and left Mary there while Kitto and Fontaine drove back to the London flat to ransack it, and Fontaine then drove back a second time. This was pretty stupid, as police could have been waiting for them. By this time, Mary Coggle wasn't being very discreet, and was wearing Mrs Scott-Elliot's fur coat and jewellery round the village. When she said she wanted to return to London, Fontaine decided to kill her as well. They beat her with a poker, dressed her in men's clothes, wrapped her in plastic sheeting and put her in the car boot. Then the next day dumped her in a stream near Middlebie in Dumfriesshire on the 18th December. After that, Kitto and Fontaine drove back to the flat for a third time, where they lived for a while. In the meantime, on Christmas Day, a farmworker had discovered Mary Coggle's body. In fact, police were already looking for them. They had tried to sell some of the stolen antiques in Newcastle, but the antiques dealer was suspicious about how little they wanted for them. He contacted police with the Ford Granada's car registration number. The police traced that to the car hire firm in London, who told them it had been hired by someone using the name Scott-Elliot. The police then went round to the flat and discovered it was empty, ransacked, and that there were bloodstains. What is weird is that they spent so much time driving around with dead bodies in the car. Mrs Scott-Elliot's body travelled 400 miles from London to Comrie before being dumped. Mary Coggie was killed in Newton Arlosh in Cumbria, but dumped at Middlebie in Dumfrieshire, 50 miles away. 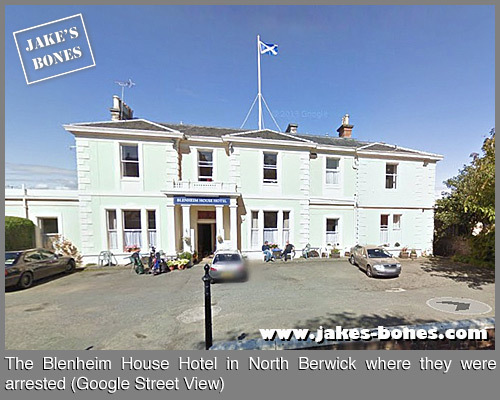 What happened during the next three weeks isn't clear, but on the 16th January they stopped during heavy snow and Kitto and Fontaine checked into the Blenheim House Hotel in North Berwick, Scotland. The hotel owner thought they looked suspicious, so called the police to check out their car. The car was the same Ford Granada they had hired in London the previous month - but they had changed the number plates to steal it. Unfortunately, the tax disc didn't match the number plates, and the police asked the two men to come to the police station to explain this, with a police officer driving the car down. While they were at the police station, Fontaine asked to go to the bathroom. The first time he flushed false papers of his down the toilet. The second time he fled out of a window. That was when the police checked the car - and discovered a body in the boot - the fifth victim. Fontaine was then recaptured after a police roadblock and taken to a police station, where he tried to commit suicide. After that he seemed to help the police, telling them where to look for the other bodies, and that's why the police ended up at my village. On the Saturday he was taken by police to the north of England to find the first body, then on the Sunday they brought him to my village. So what is the detail that was wrong ? I said at the start that there was one detail reported which was incorrect. Almost every account says that Mrs Scott-Elliot's body was found at Braco. The Wikipedia page for Archibald Hall says so, The Scotsman says so and Murderpedia says so. Even Archibald Hall's autobiography says so. And they are all wrong. 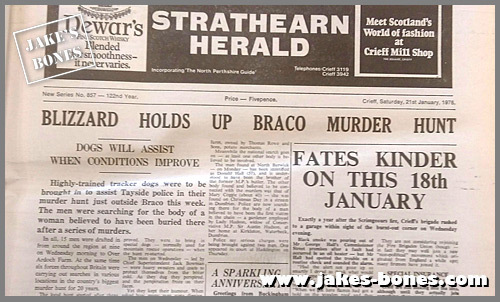 Her body was found not near Braco - but 15 miles further to the west, on the other side of Comrie ! They must have been searching around Braco based on the description they were given by Fontaine, but when Fontaine was brought to the site on the Sunday (the previous day he had taken police to the site of the first body, in Kirtleton House) and they discovered they had been looking in the wrong place all along. So my village's involvement in this murder hunt was only because of a mistake ! Even so, it's still a fascinating story. The oddest thing as well is that no-one was ever put on trial for killing Mr Scott-Elliot. Even after he admitted what happened, the prosecutors decided they had enough with the other crimes to put Roy Fontaine in prison for the rest of his life, and they did. A shock visitor to the badger sett !